Online ordering menu for Billy's Pizza & Wings. 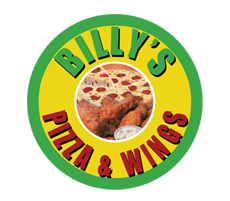 Come to Billy's Pizza & Wings in Baltimore, Maryland if you're looking for a variety of Italian cuisine! We serve pizza, wings, stromboli, pasta, and more! Try one of our hot platters such as the Shrimp Basket Platter or the Crab Cake Platter. We're located east of Herring Run on Erdman Ave. We're near Clifton Park and Johns Hopkins Bayview Medical Center. Order online for carryout or delivery!